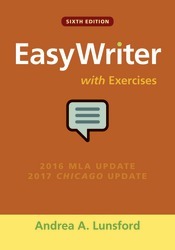 EasyWriter with Exercises is the little handbook with the Andrea Lunsford difference. It features Andrea’s friendly voice, her research-based Top Twenty, her recognition that writing today is increasingly digital and multimodal, and above all, her respect and appreciation for student writers’ potential to change the world. When your students need reliable, easy-to-find writing advice for college and beyond, EasyWriter with Exercises gives them what they need in a format that’s easy to use and easy to afford. At a low $20 net price, the sixth edition packs in even more support for writing academic and real-world genres, with examples of over 40 types of writing in the print and digital resources, and thoroughly revised documentation advice based on the 2016 MLA guidelines. EasyWriter with Exercises can be packaged at a significant discount with one of two innovative digital products: Writer’s Help 2.0, Lunsford version, or LaunchPad Solo for Lunsford Handbooks.